The cloud on the horizon slowly resolves into individual specks of white, whirling and spinning in synchronicity this way and that. Like dust motes in a shaft of sunlight or snowflakes in a breeze, they spiral slowly downwards to the ice. 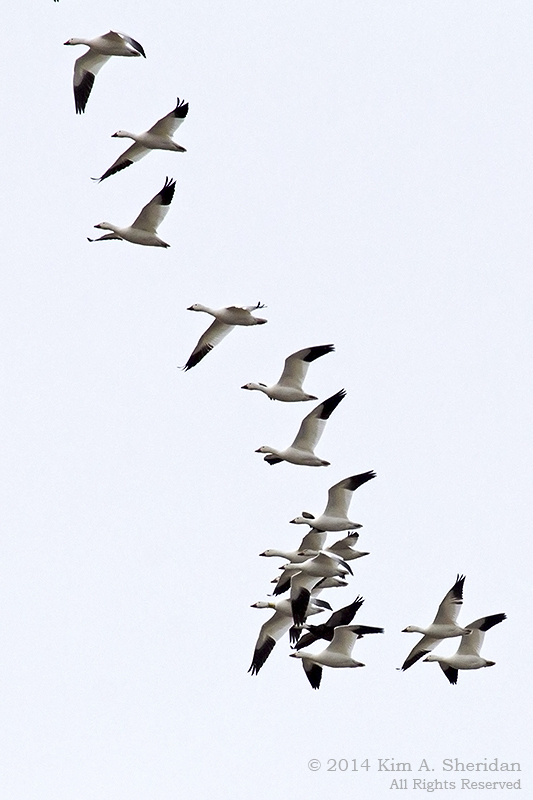 Without warning they loft up again to the sky, following paths no snowflake ever traveled; for these are not snowflakes, but Snow Geese. The ice has begun to thaw at Middle Creek WMA in Lebanon County, and the geese have followed the thaw to these fields and impoundments. This is a popular stop on their migration from winter homes along the coast to their breeding grounds in the High Arctic. 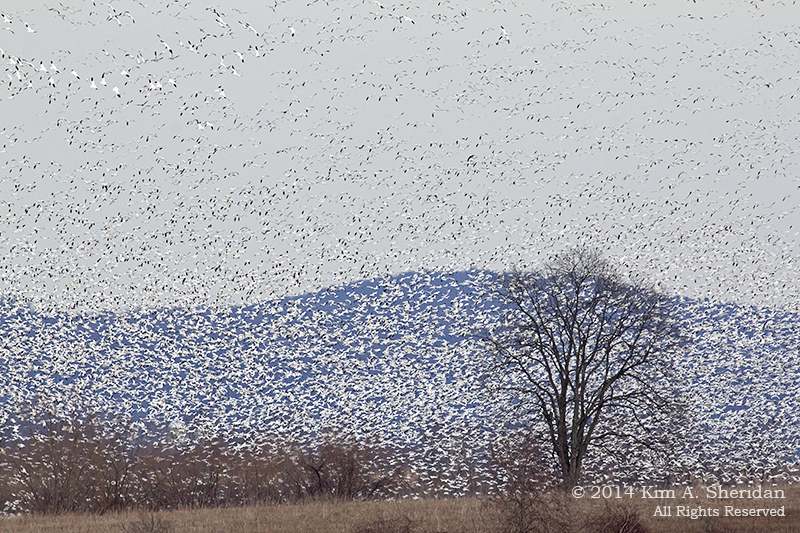 Much of the year snow geese are highly gregarious, traveling in large flocks, and gathering on staging grounds like Middle Creek by the tens of thousands. 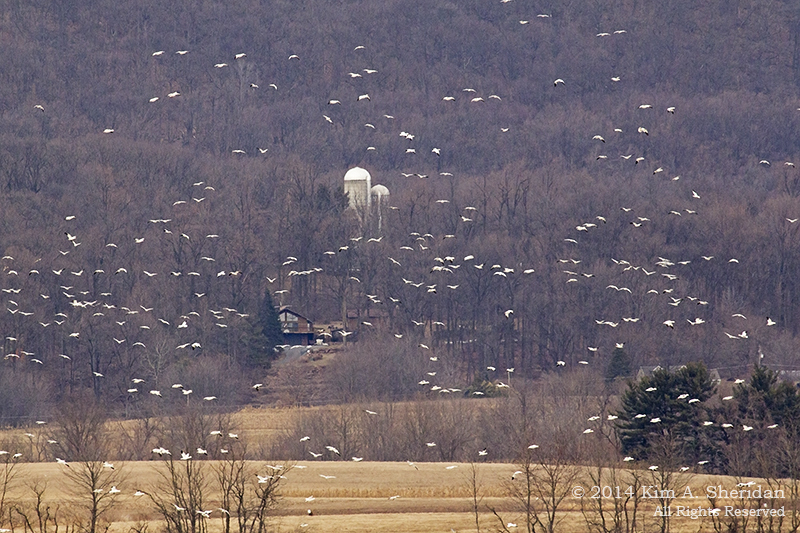 Peak migration in Pennsylvania is in early to mid-March. Once open water begins to appear, the goose population here jumps from 3,000 to 60,000 in a week. 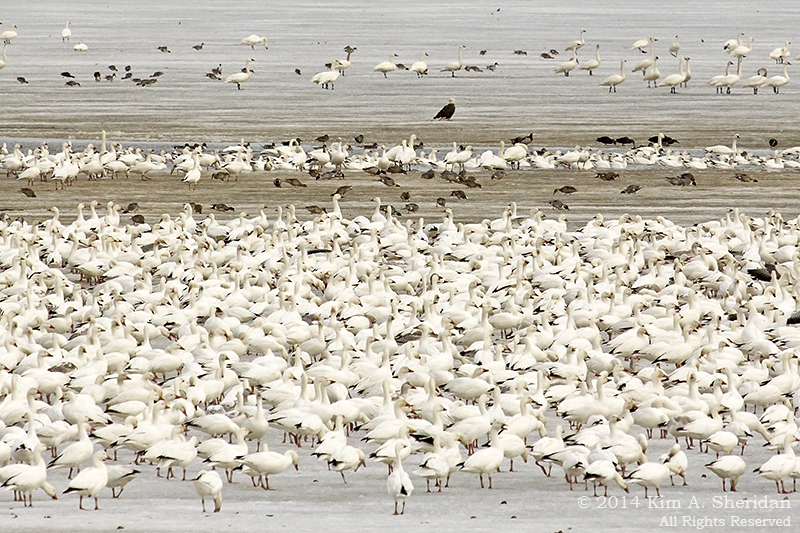 This is farm country, and this is why the snow geese are here. Committed vegetarians, they feast on grasses, sedges and marsh plants on wetlands. A few decades ago, they discovered a new grocery store to their liking: farms. Waste grain left behind on harvested fields has proven to be an abundant food source. 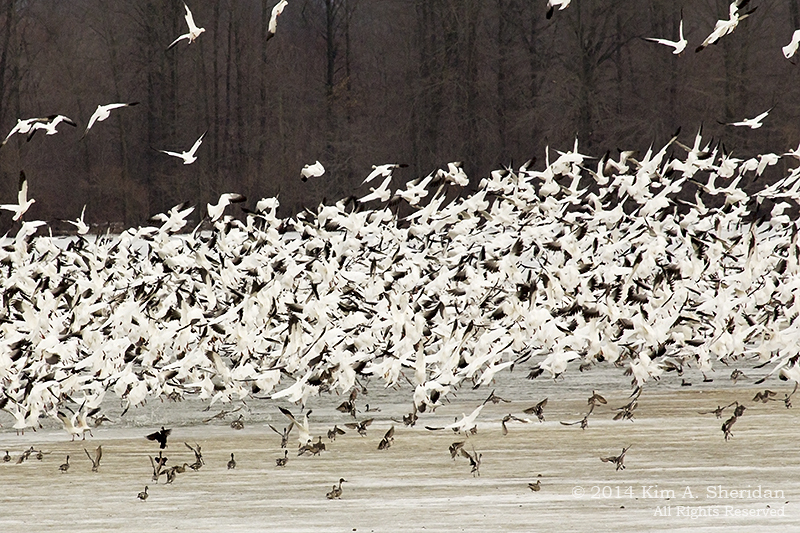 Snow geese are powerful fliers, capable of speeds up to 50 miles per hour. Where they breed in the Arctic, they are fiercely territorial, and family bonds are strong. The young will stay with their parents until their second or third year, when they will choose a lifelong mate. 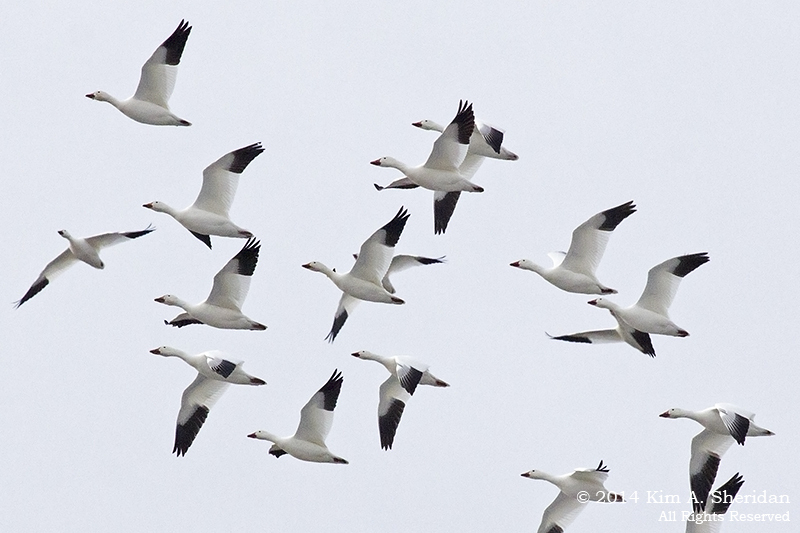 FUN FACT: Snow geese walk as well as they fly. Within three weeks of hatching, goslings are walking everywhere their parents go. By the time they can fly, they may have covered 50 miles on foot. The flight of a single bird is a miracle to behold. 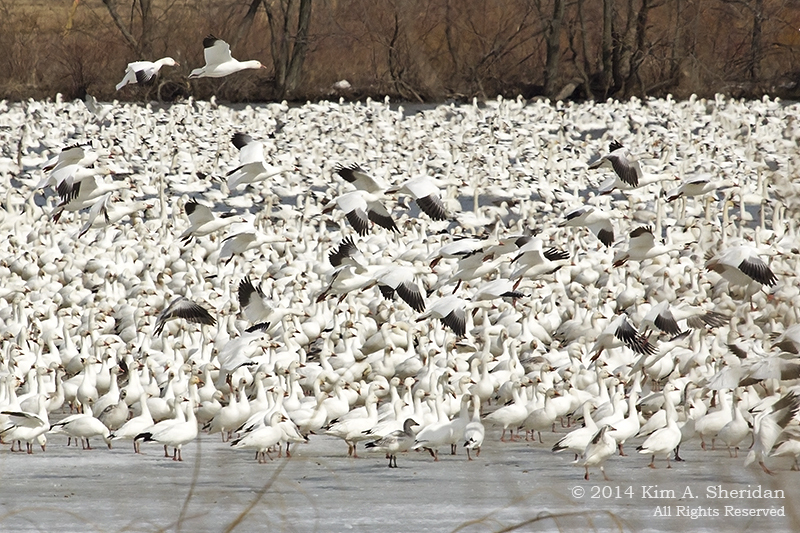 The flight of 50,000 snow geese is a spectacle. What possesses them to take off is a mystery. One moment there are thousands of honking geese on the ice. The next, there is a great WHOOSH, and the entire flock lifts off as one. The decibel level goes up by a factor of ten; you need not look at the geese to know the birds have taken off. They swirl about the sky in seemingly aimless meanderings for a short while. Then, as suddenly as they took off, the geese come in for a landing – in the exact same place they stood moments before. Why? Perhaps someone saw something they didn’t like. Feeding flocks keep lookouts, who warn the other geese of danger, predators like foxes, coyotes and eagles. 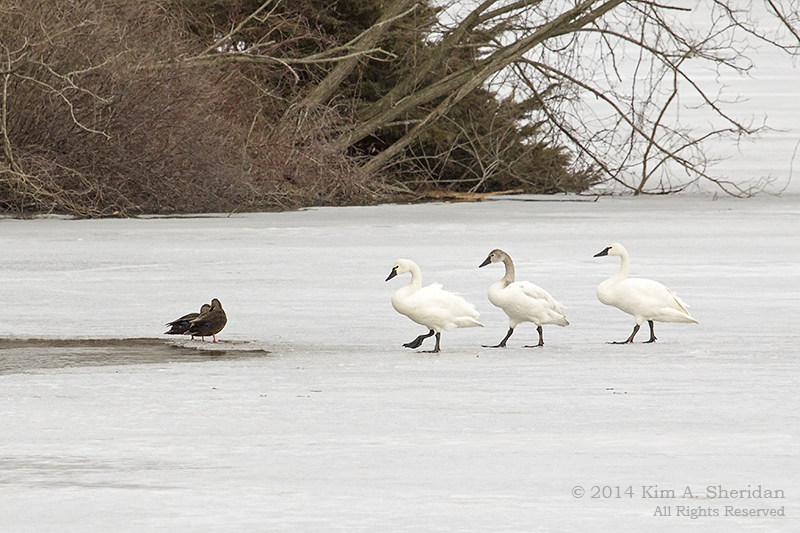 And yet – here sits a mature bald eagle, in the middle of a peaceful flock of snow geese. No alarm. No commotion. No panicked flight. The mind of a goose is a riddle wrapped in a mystery inside an enigma. There’s another white bird on the ice at Middle Creek. 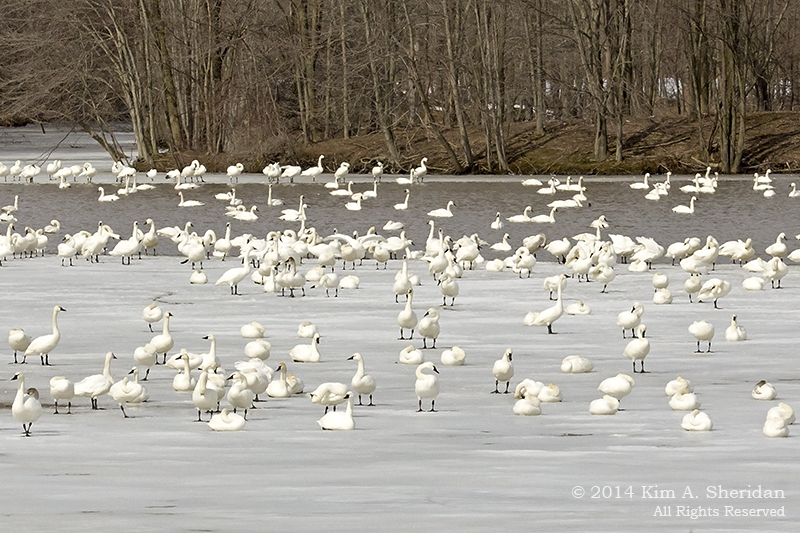 Tundra Swans are here as well, albeit in smaller numbers. Less skittish than the geese, the swans fly lower, and stand closer to shore. They also are dropping in for a short visit before pushing on to the north. Most don’t choose to march, though. Except perhaps this squadron of swans, advancing on a duck detachment in lockstep. 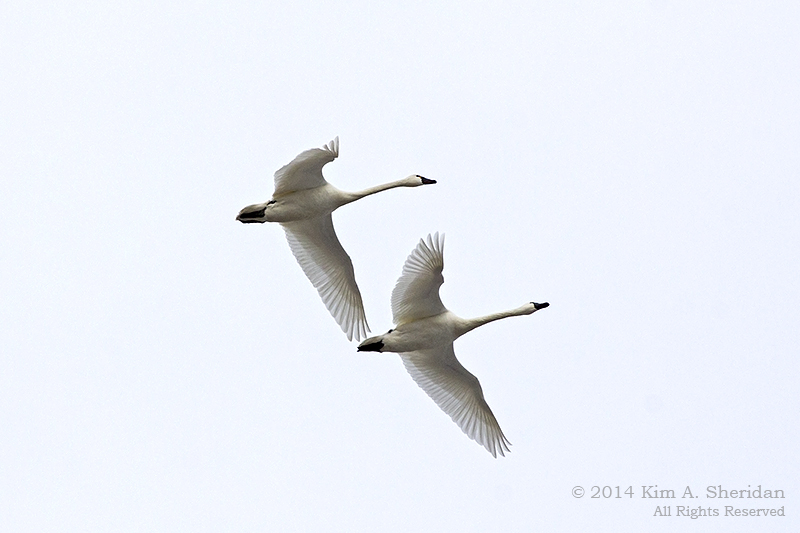 As the day draws to a close, skeins of tundra swans and snow geese fill the air. 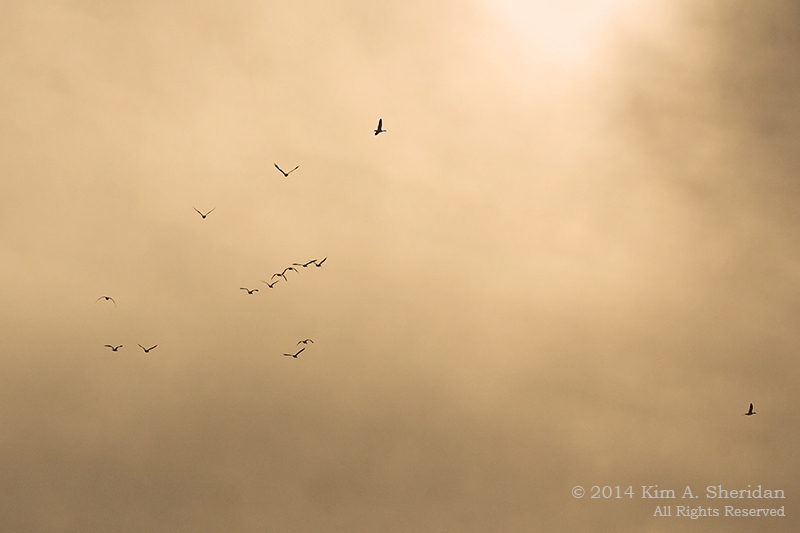 Some will fly off to search out a safe roost for the night. Many others will remain at the impoundment, where they will sleep on the open water. On the next day, or the next, a blizzard of snow geese will rise and wing their way north, towards the Arctic, towards the midnight sun, towards summer. This entry was posted in Birds, Nature and tagged Birds, Middle Creek Wildlife Manangement Area, Nature by Kim. Bookmark the permalink.